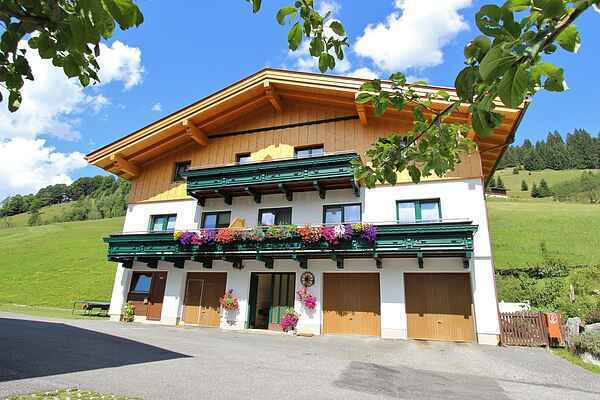 This beautiful detached holiday house is located in the district of Hintermoos, part of the well-known and charming village of Maria Alm and the Hochkönig ski area. Your holiday home, which you will have entirely to yourself, is situated on the first floor and has no fewer than 3 bedrooms, 2 bathrooms and a beautiful living room with an open-plan kitchen where your whole group can enjoy meals together. From the sun-drenched balcony you have a beautiful view of the surrounding mountains. In spring and summer this holiday house is surrounded by vast green meadows and you can really enjoy the beautiful view from the holiday house. Maria Alm offers many options and is very popular during these seasons. Thanks to its central location, Maria Alm is an ideal base for many daytrips to Salzburg or Zell am See, the Kaprun reservoir, the Grossglockner, Burg Hohen Werfen and the "World of the Ice Giants".